Currently under construction in Killeen, the Central Texas Medical and Professional Center is coming along nicely. Located on Clear Creek Road, this 17,680 square foot business center is a design build project between EVstudio and Stefek and Sears Builders. In this project, we provided architectural, landscaping, and structural design services. 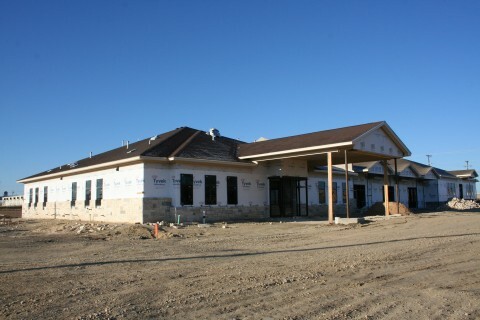 Construction completion is scheduled for March 15, 2013, with anticipation of the Killeen Pediatric clinic opening by April 1st. This project consists of a 5,800 square foot clinic, 1,360 square foot of attic storage and 10,520 square feet of professional office space. Exterior stonework and EFIS is currently underway. The following picture is an example of how we use our 3d software to help our clients make design decisions and to help the contractors visualize our design intent.